From appetizers, to mains, to desserts and midnight snacks, the holiday meal may be the biggest (and longest) of the entire year. 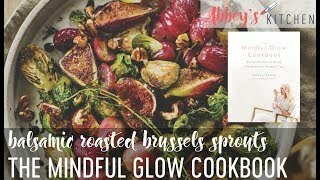 Here at Abbey’s Kitchen, we like to keep the holidays going on for as long as possible, from Christmas morning ‘til the clock strikes midnight. And the best way to do that without tapping out at turkey is Christmas appetizers on appetizers on appetizers. Being surrounded by food 24/7 throughout the holiday season, there’s no question that you’ll be tempted to reach for anything and everything that you lay your eyes on. But we’re here to help: healthy Christmas appetizers and party food ideas for the holidays that aren’t a complete bust! 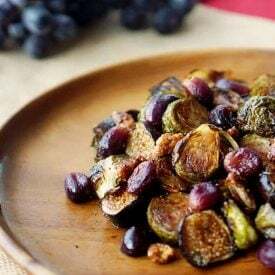 We’ve come up with a list (and checked it twice) of healthy, mouth-watering healthy appetizers and party foods that are sure to make your tastebuds sing without that post-holiday guilt factor. We’re not trying to be the Grinch by taking away all the fun in holiday food, but we have to draw the line somewhere, right? 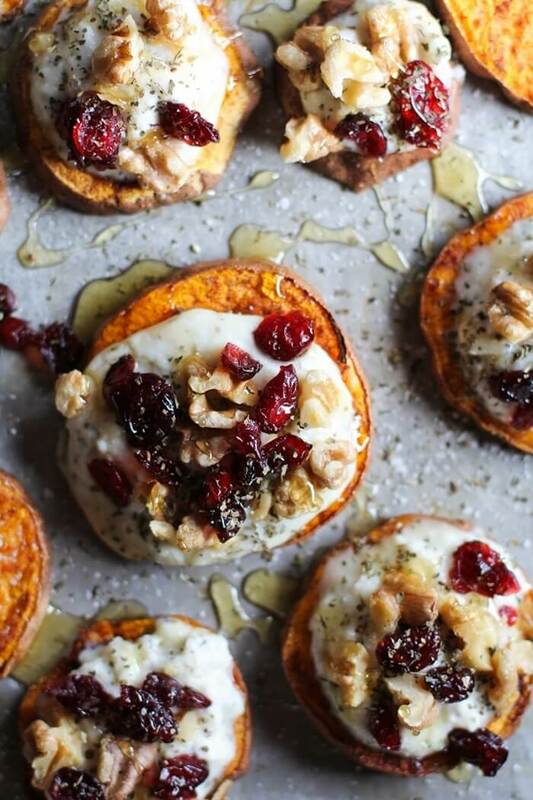 We’ve also pulled together some yummy healthy Christmas appetizers from our favourite bloggers! Check it out! 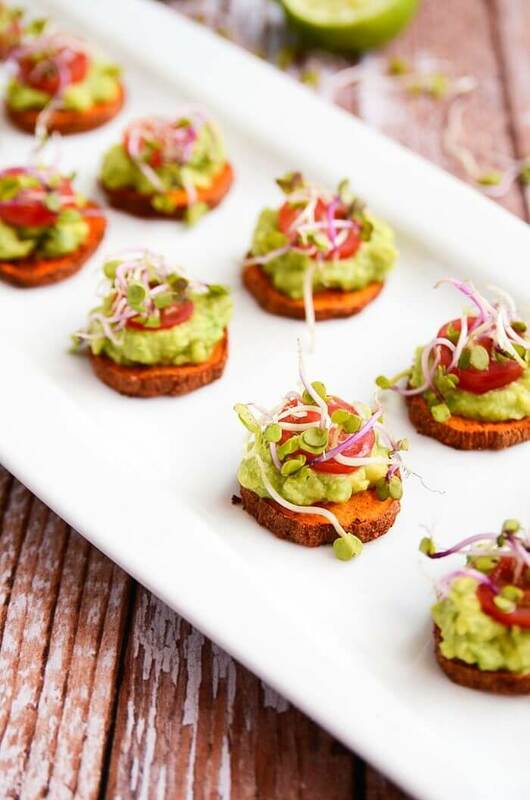 First up, these healthy Christmas appetizers of sweet potato and avocado bites set the stage for the sought-after Christmas dinner perfectly. 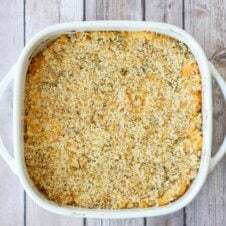 The savory sweet potato combined with the creaminess of the avocado brings out a cornucopia of tastes, while being low carb, low sugar and low sodium. 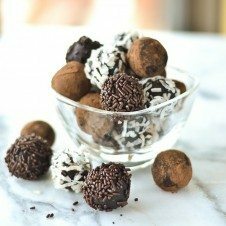 Not to mention that these will be a hit for your vegan friends and family members! 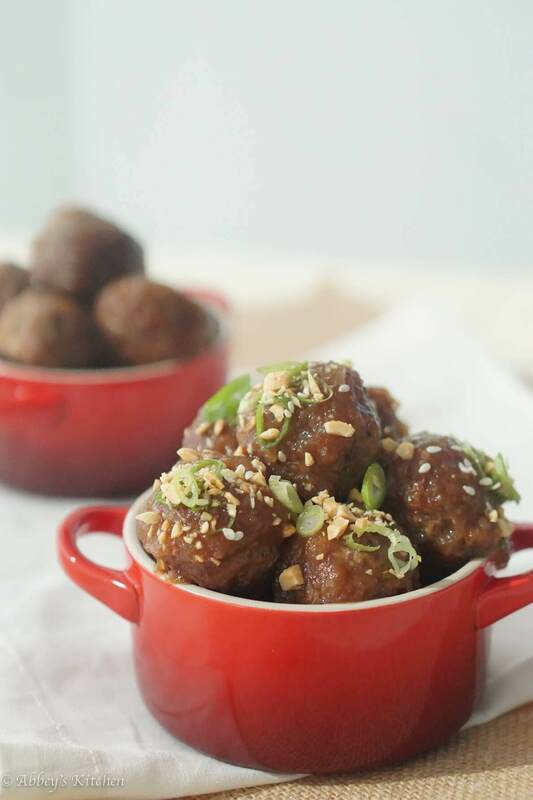 For the meat lovers out there, here’s a much leaner option compared to the classic beef meatball. With the added cranberries mixed in, this adds an unexpected, sweet punch to your favourite savory app. Talk about colourful! 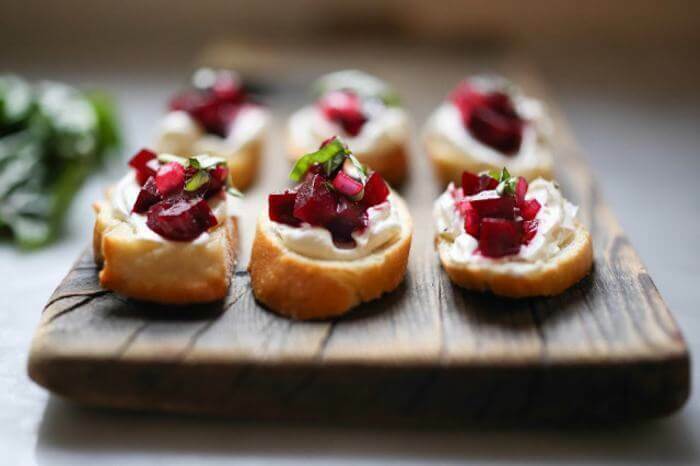 These bite-size beet, goat cheese and basil bruschettas look and taste like Christmas. High in fibre, potassium and Vitamin A, this spin on the classic bruschetta is just so hard to beet. 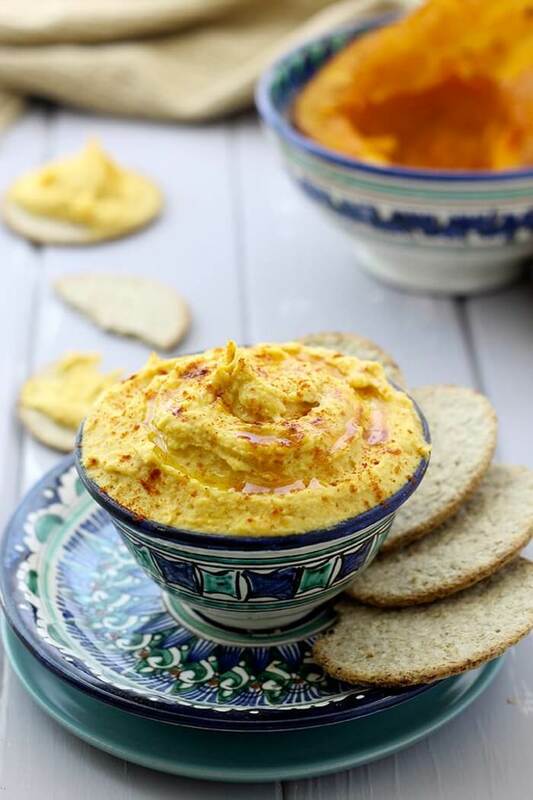 Creamy, savoury, sweet… Just a few words to describe this hummus. Butternut squash is taking your favourite hummus to a whole new holiday level in these healthy Christmas appetizers. Paired with some toasted whole grain pita, veggies or a whole grain baguette, this is going to be your go-to-dip for the holiday season. 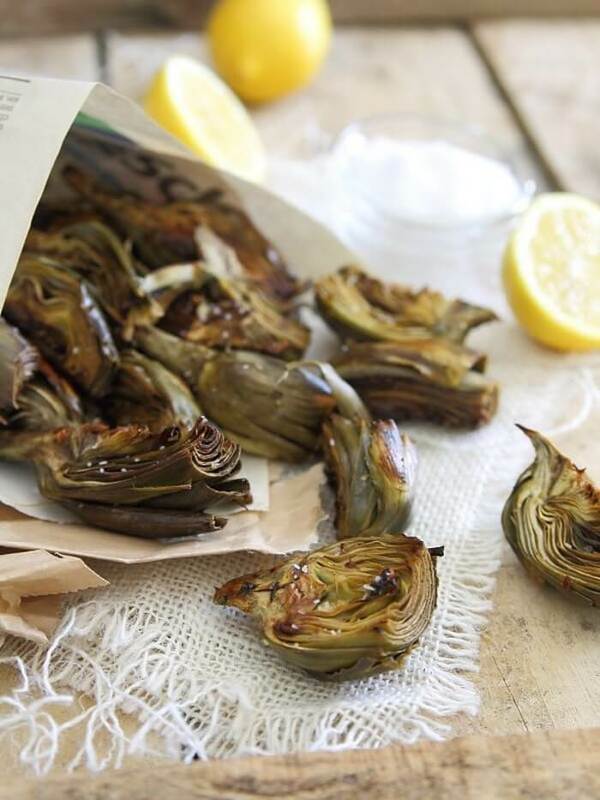 We got this recipe from Gina, the writer and foodie behind the blog, “Running to the Kitchen.” With just a simple trim, toss and roast, she claims that these baby artichokes gave fries a run for their money. Gina, you seriously had me at fries. Here’s to becoming an artichoke-addict in the New Year with this amazing recipe! 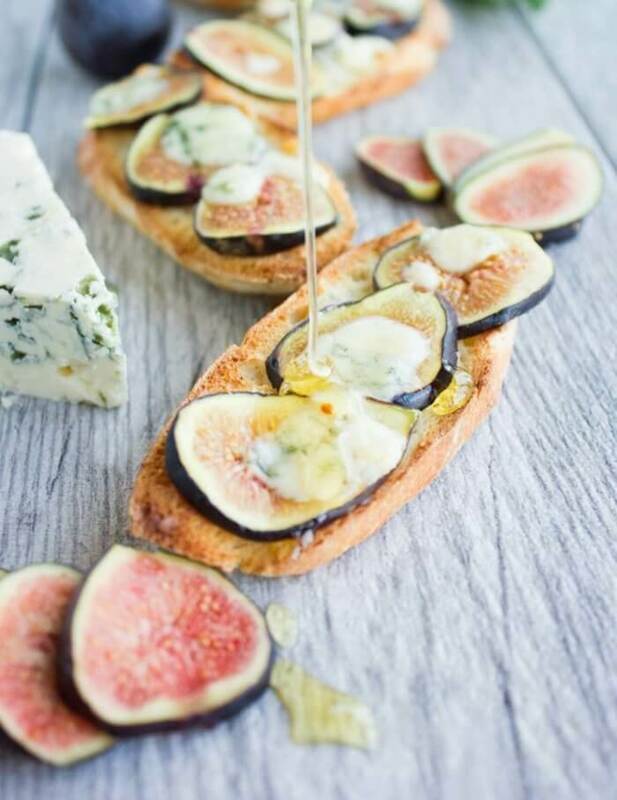 Sweet, crunchy and ooey-gooey cheesy, this is such a fun and easy way to serve a crostini. 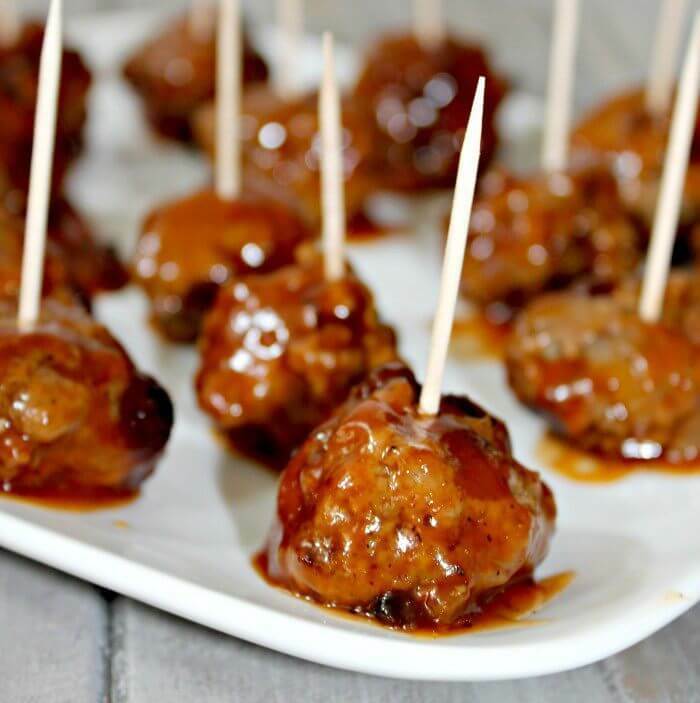 If you’re in need of a quick, last minute finger food for the holiday season, try this one. Feel free to let your hair down and get creative with it too! Peaches, strawberries, balsamic reduction drizzle… It’ll keep your guests wondering how you can come up with so many healthy Christmas appetizers. 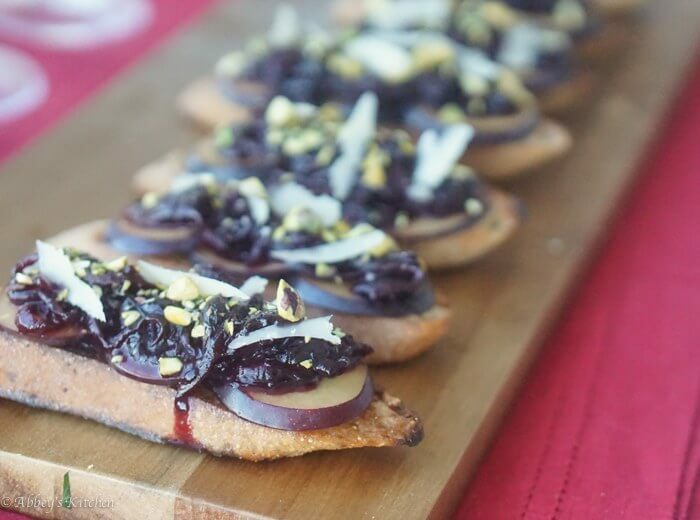 Looking for healthy Christmas appetizers with the crunchiness of a crostini, but without the added carbs? Try endive leaves! These endive leaves are a simple (not to mention healthy) substitution for your gluten-free friends and family members. 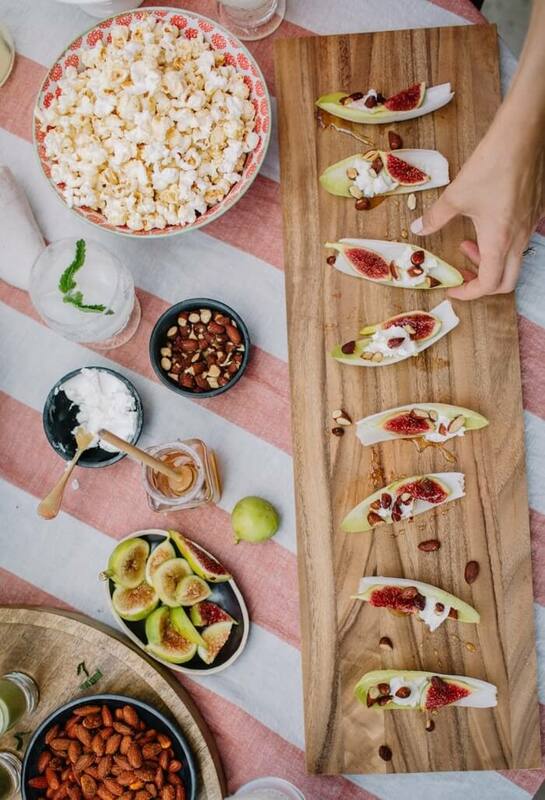 You can garnish them however you please, but we suggest topping them with creamy goat cheese, sweet figs and honey roasted almonds for an added crunch factor. We have so many good things to say about this recipe. With a filling made of Greek yogurt, this high-protein finger food will be a hit among your guests this holiday season. 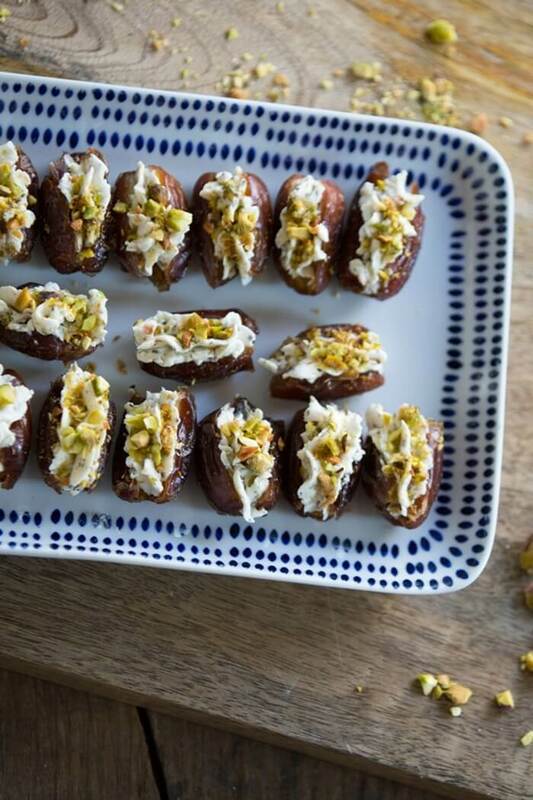 These bite-sized dates are packed with sweet, creamy goat cheese and yogurt and topped with crunchy pistachios. 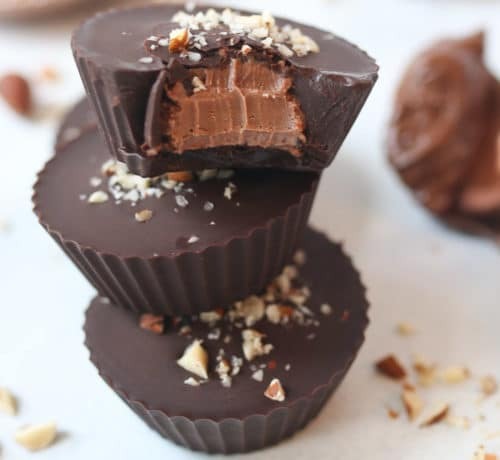 Thanks for this recipe, Kelly, these will definitely satisfy our sweet tooth! We all know that a holiday season is incomplete without mini-quiches. It’s just a fact. But this year, we’re disregarding the ever-so-classic spinach and ham version. Introducing mini quiches filled with caramelized pears and gorgonzola. Our mouths are watering thinking about it! 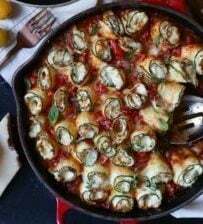 We also can’t forget the healthy spin on this one with the whole wheat crust. 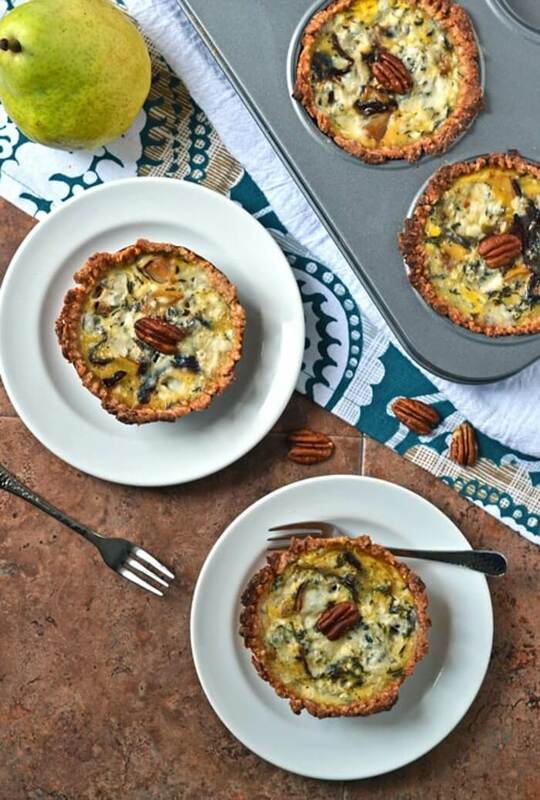 These mini quiches are sweet, creamy and savoury all in one bite. This healthy, holiday salsa is sure to be a hit at your next gathering. 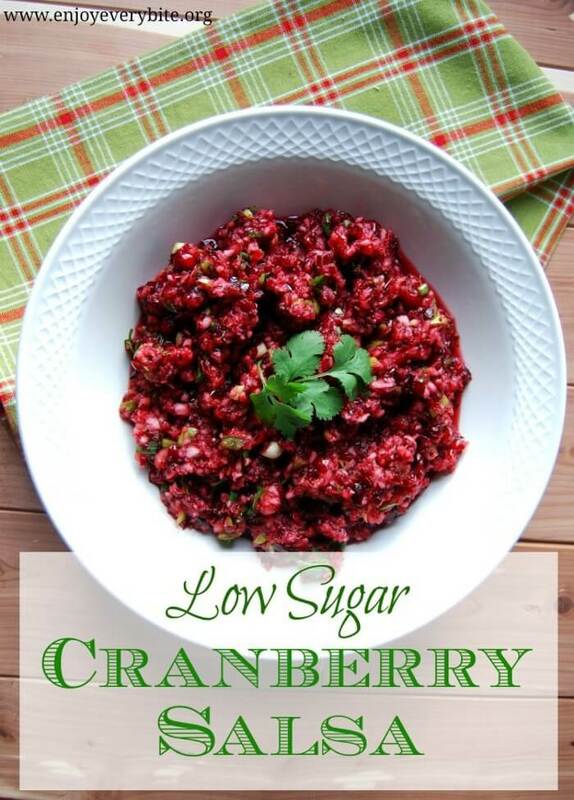 As the title of the recipe indicates- this low sugar version of a cranberry salsa highlights the natural tart flavour notes of the cranberries. Yum! Served with some whole grain crackers, toasted baguette or whole wheat crostini, your guests will be asking for the recipe of this one! 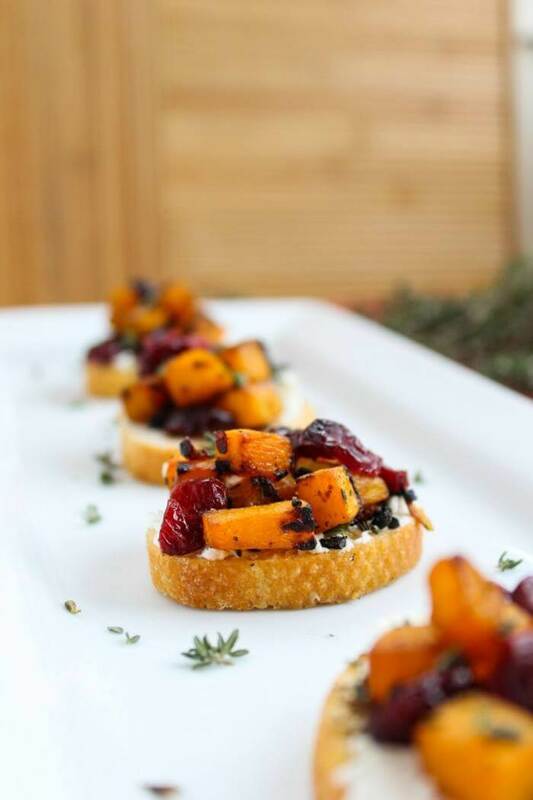 Tender butternut squash, the hint of sweetness from the cranberries, tied together with creamy goat cheese… this crostini targets all the tastebuds. Thanks to the butternut squash, this colourful finger-food is packed with fibre and low in fat, making it your holiday go-to root vegetable! It goes without saying that sweet potatoes are one of our top picks for holiday root veggies! Slice these bad-boys ultra fine and pop them in the oven to bake, and you’re left with sweet potato round crisps that are all ready for toppings! We love this combo (cred’s to Julia from The Roasted Root blog! ), with herbed ricotta and crunchy walnuts. Who said the holidays couldn’t be healthy? Christmas appetizers have a bad rep for being extremely fattening and sugar-packed. 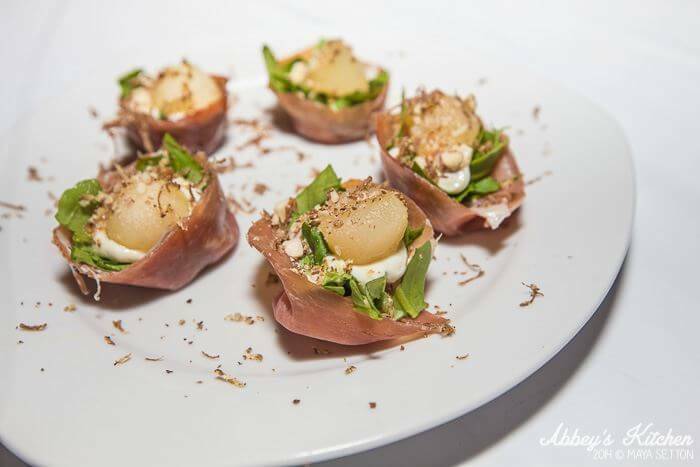 So, say au-revoir to fattening hors-d’oeuvres, because these healthy Christmas appetizers are indulgent, yet low in calories, sugar and fat. Take a rain check for serving the outdated cheeseball appetizer this year. 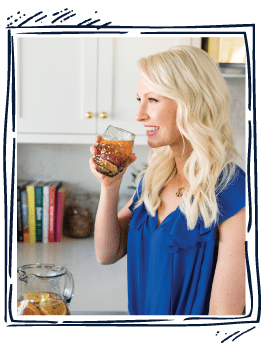 With all these creative, healthy Christmas appetizers and party food ideas leave your guests wondering how you did it at your next holiday party. Serve, eat and enjoy – without the guilty feeling of overindulging this holiday season. Love these – thanks for all the great ideas! 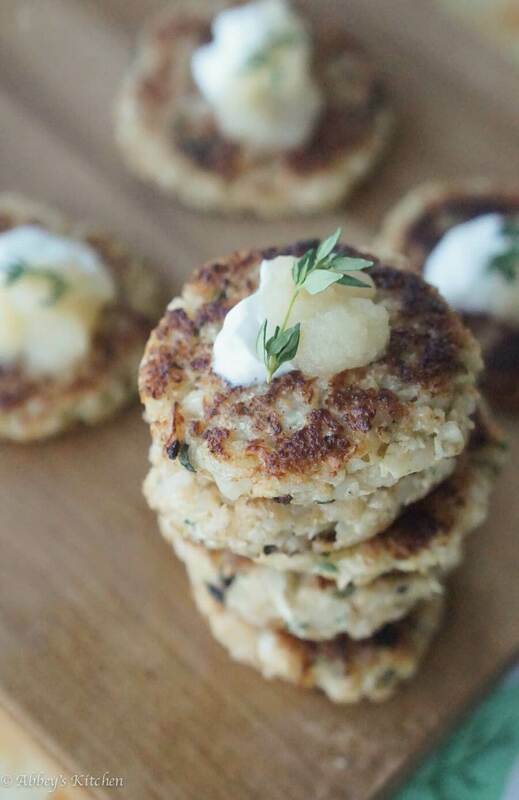 I loved your Low Carb Paleo Cauliflower Latkes recipe. I am gonna try this one for sure. They all sound so good. Definitely going to try making the Prosciutto Cups with Blue Cheese Mousse. Nicole you will love them! !